Marketplace, Freshco, Brooklyn Harvest, Uncle Giuseppe’s, JRS Fresh Market, Shop N Bag or Market Fresh stores during the period from January 13, 2017, through January 26, 2017. You may enter the sweepstakes by depositing the entry form with your name and address into the ballot box at the participating store. through January 26, 2017. NO purchase necessary. You will be given an entry form and may enter the sweepstakes by completing and depositing the entry form into the ballot box at any participating store. Club Card membership is free and is open to everyone who completes a customer enrollment form and has the form processed. operation of the Club Card program. To qualify for entry, a valid name and address associated with the customer’s Club Card must be on file with Sponsor. 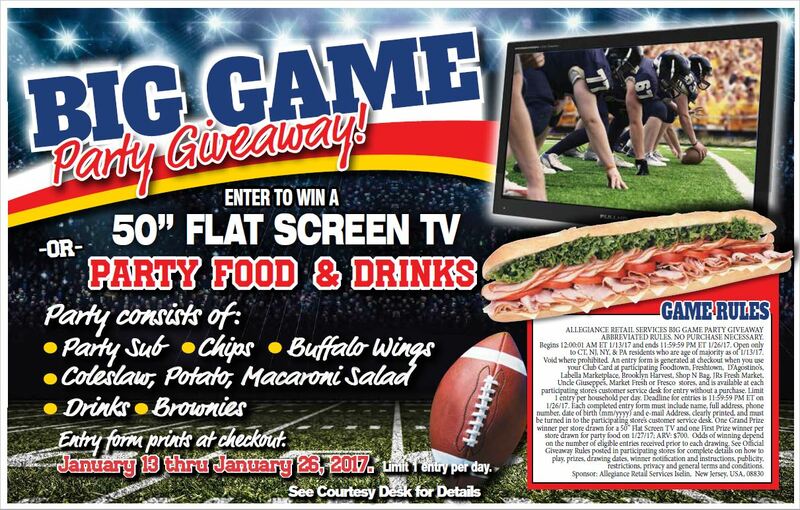 Eligibility: This sweepstakes is open to legal residents of New York, New Jersey, Connecticut and Pennsylvania, who are 18 years or older as of January 13, 2017. Employees, officers, managers and directors of Sponsor, Foodtown, Inc., the respective owners of the participating stores, and their affiliates, advertising and promotional agencies and sweepstakes suppliers, including the spouses, household members and dependents for federal tax purposes of all the above, are not eligible to participate in this sweepstakes. This sweepstakes is being offered at participating Foodtown, Freshtown, D’Agostino, LaBella Marketplace, Freshco, Brooklyn Harvest, Uncle Giuseppe’s, JRs Fresh Market, Shop N Bag or Market Fresh stores in NY, NJ and PA. This promotion is void where prohibited by law and is subject to all federal, state, and local laws and regulations. Club Cards that are stolen, fraudulently obtained, tampered with or otherwise altered are not eligible for entry. If multiple names are associated with a card, the prize will be awarded to the primary cardholder. Only one winner per household. will be awarded to an alternate. All prizes are non-transferable and will be awarded in person at the participating store. Prizes will not be delivered to winner’s home or business. Affidavits Of Eligibility/Rights To Publish: Each prize winner selected may be required to verify his/her identity and address, and execute and return an affidavit of eligibility and a liability/publicity release (where permitted) within thirty (30) days of prize notification or attempted prize notification, or the prize will be forfeited and an alternate winner will be selected. Acceptance of the prize by winner constitutes permission for Sponsor, Foodtown, Inc. and the respective owners of the participating stores, and their agents, to use the winner’s name, photo, voice, biographical information, and likeness for promotional purposes in television, radio, Internet and print advertisement without further compensation or notice, except where prohibited. or attributable to, each prize will be the sole responsibility of its winner. An IRS Form 1099 will be filed, if required, for each prize awarded. List requests must be received by April 6, 2017. Requests not fulfilling these criteria will not be acknowledged. Allow 6 weeks for fulfillment of request.